Cernunnos is an evocative image from our ancient history, yet there is very little that has come through time to enable us to understand what this image of Cernunnos represented for the Celtic tribes around Europe, who lived in deep forests and whose survival depended on the flora and wildlife around them. We know that they were very capable hunter/warriors yet apart from Totemism there was no identifiable unified Pan-Celtic religion. The enigmatic figure of Cernunnos has come through to our modern times, reawakening our need to connect to the land and to understand our kinship to the wildlife that inhabits what is left of our wild places. Enthusiasm for the worship of deities who display a combination of human and animal characteristics has resulted in Cernunnos being associated or melded with other horned gods, such as the Greek god Pan, the English Herne the Hunter, and the Roman Dis Pater. However, Cernunnos has his own separate identity, although there are overlaps, like fertility, the hunter, and the fact that the Celts believed that they descended from Cernunnos, as the Romans believed that they descended from Dis Pater. Fortunately, we can focus in on Cernunnos due to a cauldron found in the Danish Jutland called the Gundestrup Cauldron, which has been dated to around the 1st or 2nd century BC. It had a diameter of 69cm and a height of 42 cm. It was mainly of silverwork, although it had gold, tin, and glass for eyes. It was found in its separate panels which numbered 13 in all, although a 14th panel is believed missing. There were seven outer plates, portraying different heads, some female and some male, although one of the outer plates was missing. Celtic heads symbolised the soul, so we can associate the heads as ancestral heritage. There were five inner panels, one of which depicted Cernunnos (see image below). There was also a round plate for the base which depicted a sacrificed bull. The cauldron itself is considered a sacrificial bowl. Cernunnos is on the inside of the bowl, indicating that he is associated in some way with its contents. 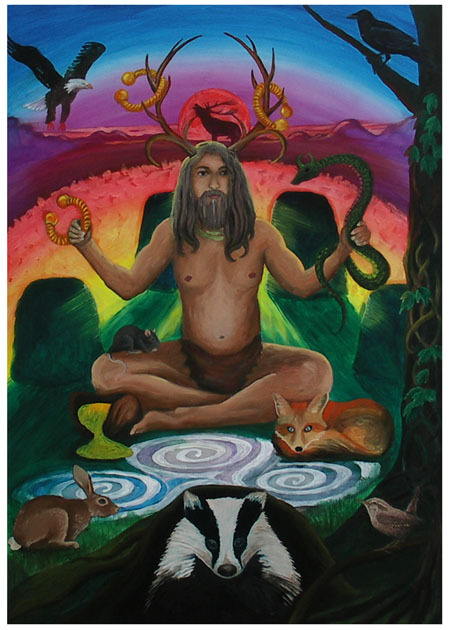 Cernunnos is surrounded by animals and holds a horned serpent and torc, whose symbolisms have both been lost in time. The horned serpent is said to represent Mercury and the usual phallic associations. The serpent in ancient times represented divinity. The head of the serpent resembles a ram’s head and horns. This gives us an indication of the symbolic power of the serpent as representing a fiery force and renewed vitality of the Spring Equinox, where all Nature is seen coming back to life. This indicates the power behind both Cernunnos and the use of the cauldron. The horned serpent is held over the sacrificed bull at the base, suggesting that not only were the contents from a bull but also from a serpent. On another panel of the Gundestrup cauldron, many warriors are depicted as lining up to be dipped into a cauldron by a large figure. Large figures in early pictorial works often depicted someone of importance. Above them, those who have been dipped follow a serpent. On yet another panel, the serpent is seen with a figure that may be interpreted as being Mercurial. The being seems to be holding a cosmic wheel. The Hen ate the seed, and Kerridwen became pregnant. She carried Gwion for nine months with the intention of killing him at birth but, upon seeing how beautiful he was, placed him in a leather bag and gave him to the sea. Eventually he was found by Elffin, who named him Taliesin (“Bright Brow”). The elixir produced a state of consciousness which allowed Gwion to experience the different frequencies or levels of consciousness of Mother Earth herself, exemplified by the different creatures that she sustains. These frequencies can be further divided into the elements earth, water, air and fire, and also their duality – prey and hunter; passive and active. As Gwion progresses he experiences the high frequency of the element fire (the seed). It is commonly presumed that fire is a destructive element, which it is on the outside, yet within fire seeds new life. Fire can only be safely experienced by detaching from the body through the consciousness rising into spirit. At this point, Gwion enters the womb of Mother Earth herself, where he remains for nine months. He is then placed into the sea, the Great Unconscious, a phrase which inadequately expresses the immense depth and space of which now his mind becomes conscious. This, then, is the realm of Cernunnos, reflected in the work of the Shaman, who in ancient times was also called a Serpent Priest. He can consciously enter the many levels of what we term the subconscious or Underworld. Cernunnos differs from the Greek god Pan in that Pan is evoked when the suppressed subconscious suddenly opens and the individual struggles to control the now open Pandora’s Box, within our polite society. Cernunnos is, on the other hand, immersed in this vast subconscious field, fully in control of the immense forces which he can unleash at his will, for good or for evil. Cernunnos also differs from Herne the Hunter in the fact that Cernunnos takes the position between both prey and hunter. The elementary grading system confirms that our Western mystery system has its roots in Shamanic lore. In the grading system Air precedes Water because within Hermetic thought, Fire and Water give birth to Air and Earth, as demonstrated in the Court Cards of the Tarot. Kings/Fire; Queens/Water; Princes/Air; Princessess/Earth. The other object held by Cernunnos is a torc, generally considered to be a symbol of wealth and high social status. The serpent and the torc are held either side of Cernunnos, symbolising that Cernunnos sits between spiritual power (serpent) and material status (torc). It has been suggested that a torc may have been used in ritual initiations. My own idea regarding the torc is that it represented symbolically the ability to communicate with the gods, and that the original version was actually a communication device worn around the neck, which was later replicated. This idea comes from my own experience while in meditation. I was given some information of which I asked for verification through a gift. A few weeks later, I was gifted with a very old Viking torc. This seemed to connect the torc with inner communication, which would have given status to an individual in Celtic culture. Was it possible to have such technology as a communication device in our ancient past? We can consider examples from Irish mythology in the working silver hand of Nuadha, King of the Tuatha De Danann, who also brought to Ireland four magical instruments: Morfessa, Stone of Fail which would cry out under the true king of Ireland; Semian Cauldron Dagdia – no company ever went away from it unsatisfied; Uiscias, Sword – once unsheathed no-one could resist it; Esras, Spear sleg – no battle was ever sustained against it. These instruments have symbolically come down to us in the Tarot cards as Pentacle, Cup, Sword, and Wand, and also represent the different frequencies experienced upon taking the elixir from the cauldron. They are also experienced and explored in our modern day magical grading systems. 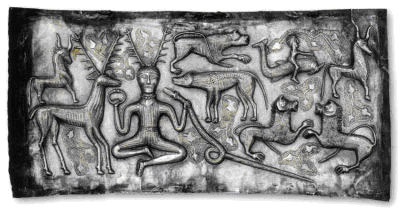 Cernunnos, as shown on the Gundestrup Cauldron, was a Shaman/Serpent Priest, who wore on his head a pair of antlers with seven tines which touched the antlers of a stag, showing the totemic beliefs of the Celtic people. During the Vietnam War, the American military wished to recruit American Indians as scouts, but upon cutting their hair the scouts lost their amazing ability to track, a phenomenon which, according to the elders, was due to the fact that long hair was the key to their extraordinary tracking ability. Hair was discovered to be a sensory perceptor – the body’s nervous system acting with the outer environment. It seems to me that the antlers on Cernunnos express the same kind of animal instinct, further symbolising the communicative capabilities of the shaman in an altered state of consciousness. There is a truth within Nature that calls us back to her in very subtle ways. This truth cannot be found in our modern-day technologies, which in fact diminish it. When we are immersed within nature, we are transported into the present moment that beats in time with our heart – the very pulse that connects us to our spiritual reality within a larger universe, revealing also a duality within us that is of life and death. It is in the wild, Chthonic archetype Cernunnos that we connect to the spiritual pulse of the wilderness and of our own cyclic changes. His first influence can be felt during love-making, where the sensual fluids begin to work in overdrive, connecting us ever-deeply to the universal pulse that climaxes into pure love. With it comes a strong feeling to reconnect with and sometimes recapture Totem animals, representing our primeval survival instinct. When the first meeting takes place with Cernunnos it can be frightening, as he wields his large club, testing how strongly we hold on to life, which is only one side of nature. He is the ritual orchestrator and initiator into death and rebirth, which gives Cernunnos the unique task of the transference of consciousness. For further study, an excellent paper by Phyllis Fray Bober entitled “Cernunnos: Origin and Transformation of a Celtic Divinity,” published in the American Journal of Archaeology, Vol. 55, No. 1, ps. 13-51, is available on the internet.